Looking for ways to come out on top? Then take a look at our Black Friday survival guide! Our team have put together their very own tips and tricks for Black Friday shopping, where being prepared is key. Read on to find out more. To get the top deals, our best advice is to prepare so you know exactly what to look for on the day. If things go to plan, you’ll get just what you want at a bargain price. Escape the madness in a flash with our preparation advice, and conquer the crowds on the day. First things first, plan what you need to buy. Set aside spending money and priority buys for Black Friday, so you know when to stop. It’s not worth missing out on a dishwasher worth hundreds of pounds for the sake of a discounted plate set! Although it sounds obvious, shoppers can get carried away. By planning your budget and list of items, you’ll have the motivation to focus only on the important deals that drop in your inbox. Remember: a bargain isn’t a bargain if it doesn’t meet your exact requirements. If you’re looking for electricals and appliances, you’ll find some of the best discounts on Black Friday. However, the number of brands and models can make it all a bit confusing. It’s worth considering specifications beforehand so that you’ll know which product is best for you. Why not check out our buying guides to give you a helping hand? We also recommend measuring spaces to make sure the item will fit. A new Smart TV won’t look so smart if it’s crammed into the only space your home allows. In case an item isn’t what you expected, you should also check the retailers’ return policy before buying. Check out retailers’ Black Friday pages for teasers of what you can expect. Take note of Black Friday sale start times and dates – and whether they are on in your local stores. You can also track the retailer’s social media profiles for updates (e.g. searching #blackfriday), and set up mobile alerts for when they post. Or, your friends and family may have insights on deals that they’ve seen advertised. It’s worth discussing the event with them to see if they have any useful advice. If you’re in the market for a deal on the day, simply wait for emails to drop in your inbox for first pickings. However, we highly recommend planning beforehand! Prepare for Christmas early and avoid the festive stress. Think about gifts now and save yourself time and money for upcoming months. Why not introduce the tech lover in your life to a futuristic home cinema system? Or, make life easier for the family cook with a brand new oven or microwave. Don’t forget portable speakers for your much-loved music fanatics! You’ll find something for almost anyone with many retailers taking part in Black Friday. With wrapping paper and ribbons at the ready, there’s no better reason to shop while the prices drop. And, why not make yourself a Black Friday playlist? Choose some calm, relaxing tracks to stop you burning out too quickly. You could even choose some festive tracks to get yourself into the Christmas spirit! If you know where you’re going to shop, register an account and sign in before the event. Also, add your payment details so you can speed through the checkout – creating an account takes time, and websites may load slowly with demand. “You can try to speed up your Wi-Fi by placing your router in an open space, uninterrupted by walls or objects. Also, boost your computer by uninstalling programs you don’t use through the control panel”. The early bird catches the worm, just like the early shopper catches the best deal! Once you know what time the event starts, set an alarm and don’t snooze, as online shops are open at all hours and some stores open early. With Black Friday becoming more and more popular in the UK, prepare for traffic and set off a few minutes early. Perhaps even pack a few snacks and some water too. Taking regular refreshment breaks will help keep that stress at bay. If you are buying more than one item from a website, it may be worth buying the best deals quickly before they sell out. Black Friday isn’t the time to browse – get in there at lightning speed! As long as you have an internet-connected device on your bedside, you don’t even need to get up! Mobiles are a popular choice: in previous years, IBM reported that they made up nearly half of Black Friday online sales in the UK. It’s no surprise, as you can check deals anywhere and compare prices across the web. If you’ve planned ahead and know what you want, stick to your plan! Get what you need first and only be tempted to look for luxuries afterwards. You might spot the perfect television for your brand spanking new pad and add it to your basket. But wait…you find a heavily reduced HD recorder too! You add the HD recorder after reading about it and…oh. The television sold out. You then remove the HD recorder as you need a TV to use it. Don’t let this happen to you! It might be worth creating a checklist of things you need in order of priority so that you can navigate the store efficiently. You could also get a tech-savvy family member to help with tracking down the best deals. Worried about what your partner or family might think of your shopping habits? Be armed with excuses! Just focus on how much money you’re saving, and this will be your final shop…until next year that is. You should expect large queues in-store and high website traffic online, which can slow you down. Don’t cope well? Embrace the true Brit inside and don’t let anyone fault your queuing etiquette. Use that playlist we talked about earlier, escape into your headphones, focus on your breathing, and just concentrate on all those amazing deals! Make sure you stretch regularly if you’re standing for a while, and you could even spark some interesting conversation with your queuing neighbours. Preparation is essential, but some deals are worth waiting for – so try to stick it out! Dedication is the key to success, as they say. If you miss out on Black Friday, you’re not to panic! Cyber Monday means you can get the best deals from your computer, smartphone or tablet. As deals are on all day, you’ll still have a chance to get in on the event if you’re working 9 to 5. Even better – items can be delivered to your door, so you can sit back and relax. Black Friday is a yearly event in November where retailers offer huge discounts. It always falls the day after Thanksgiving in the US, unofficially marking the start of Christmas shopping. Although the event has been dedicated to spending for decades, it only recently became popular in the UK. With £8bn predicted spend between Black Friday and Cyber Monday in 2017, there’s no doubt that it is popular with savvy shoppers. It causes a whirlwind every year, with the date marked on the calendar of every bargain hunter. As jaw-dropping discounts are guaranteed, the high street is pushed to bursting point. Online shoppers: Cyber Monday is the day for you! It started in 2005 to target online retailers, due to the rise in internet sales. Cyber Monday falls on the Monday after Black Friday, giving you even more time to shop ‘til you drop. It’s the obvious choice for those who’d prefer to find a bargain from the comfort of their own home, instead of battling the crowds. As the internet is open 24/7, you won’t be left out in the cold! Feeling inspired by the tips above? Then why not join in with our Black Friday event? euronics specialises in top branded electricals and appliances, so you can get quality for less. We’re offering a huge range of unbelievable discounts at our exclusive Black Friday sale from the 12th November to the 30th November – you’re sure to grab a bargain! If you miss out on these incredible deals, don’t worry too much. euronics has amazing deals all year long. We also offer free local delivery to UK mainland when you buy online and can even install appliances for you. euronics sell top quality branded appliances and electricals online and in-store. Find your nearest store today. Last week I noticed our local charity shop had piles of vinyl records for just a few pence each. I had no clue what to use them for initially, but picked up a few that didn’t look too good music wise to take home for crafting. 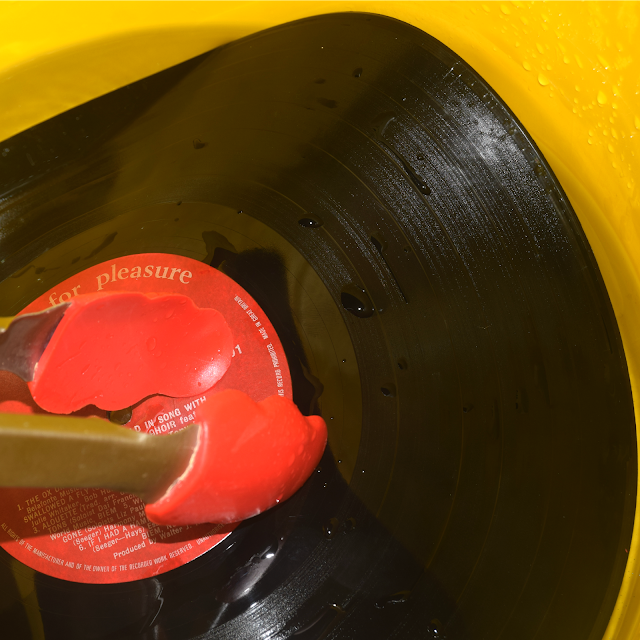 My apologies to any vinyl fans out there, I know this may be sacrilege to some! 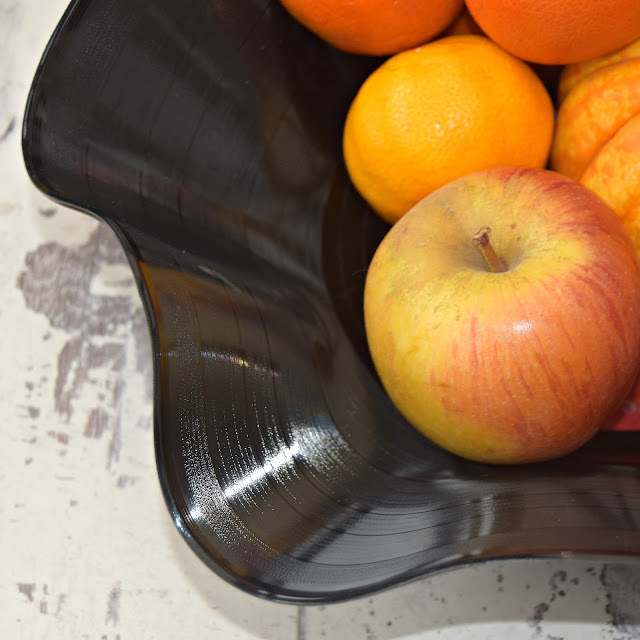 With the new addition of our Bosch Sky variable temperature kettle from Euronics, I decided to create bowls using our new (old) vinyl records, combined with some hot water and a little manipulation with kitchen utensils. I’ve always loved vinyl records but simply don’t listen to them any more, so this way I can still have them around, but with a little more use day to day. Fill your kettle and boil fully. The great thing about the variable temperature on our Bosch Sky kettle is that I can select a cooler temperature for our coffees for example, but for a craft like this where maximum heat is key, I can whack it up to 100 degrees. The hotter the water, the more pliable the record will become. Whilst the kettle boils, place your large container on a towel to catch any leaks or spillages. Then place your Pyrex bowl upside down inside. 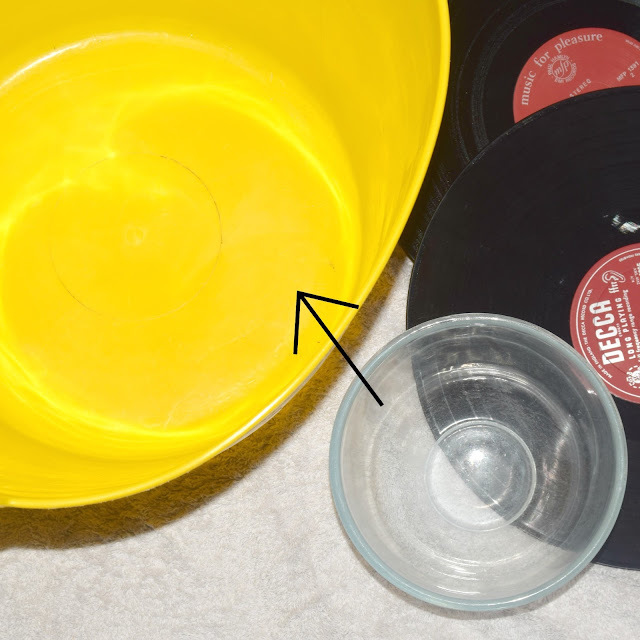 Then just place the record on top of the bowl, as central as possible. Once your kettle has boiled fully, pour water over the top of the record, you will see it start to warp and bend very quickly. 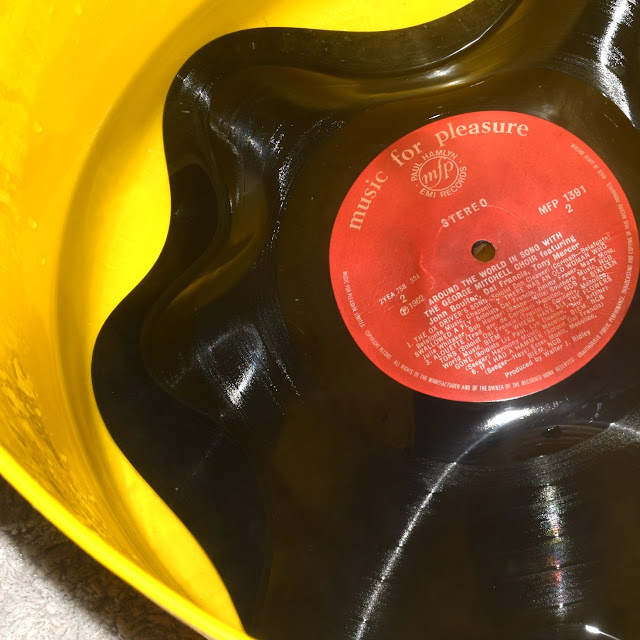 If you have a large record and container, you may want to pop some boiling water in there first to give the record more heat, and then pour another kettle load over the top. Once the record starts to flop in the boiling water, hold it still with one utensil by firmly pressing down on the centre of the label. With the other, pinch and bend the sides to get the basic shape you want for your bowl. If you need to even out the shape, you can dip the chosen side back into the boiling water and re shape as required. Be careful though it’s super hot! Your record will go hard again within a few seconds out of the water, so you need to shape quickly and simply leave to dry or dry with a towel. 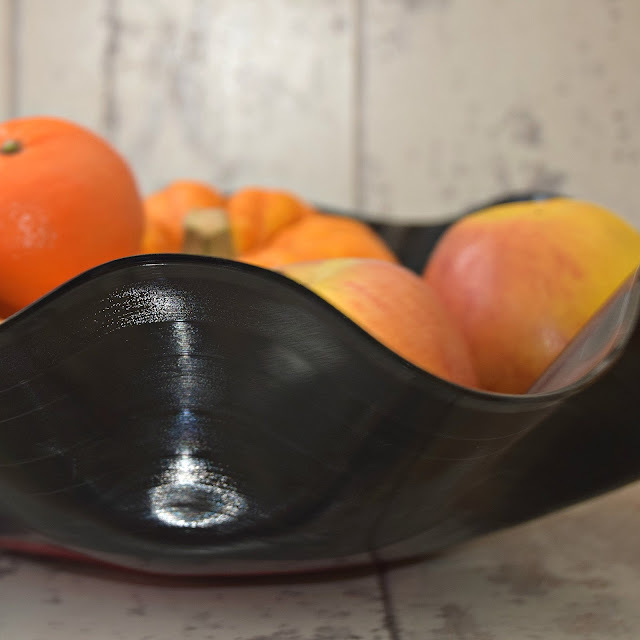 Now your record bowl is all finished and ready to use. This is such an easy craft to do and I think they look really cool and a little different. 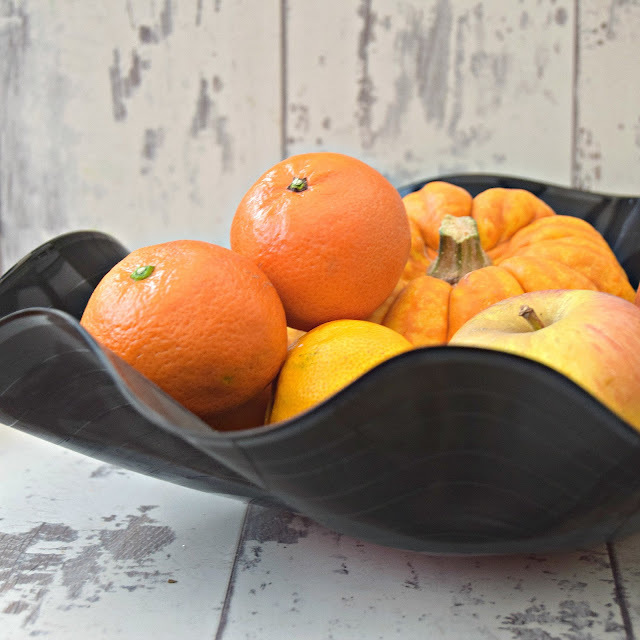 These are a great addition to a room and handy to use for a slightly more exciting looking table spread, fruit bowl or seasonal display. The kettle we used for this craft worked so well. Being able to select a higher temperature on the Bosch Sky with the simple touch screen display, meant that I could get the maximum heat needed to melt the record, making the craft so much easier. This kettle is light weight, extremely sturdy and even boils quickly with its rapid boil function. It definitely boils quietly compared to older models, and without gushing out too much steam into the kitchen too. Holding up to 1.7 litres of water (over six cups of tea! 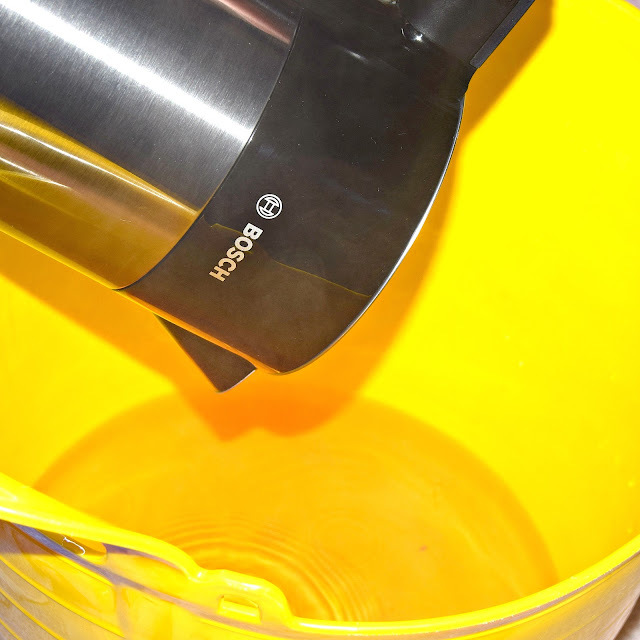 ), I was able to boil water super quick which was great doing something like this where you may need another quick load of boiled water. 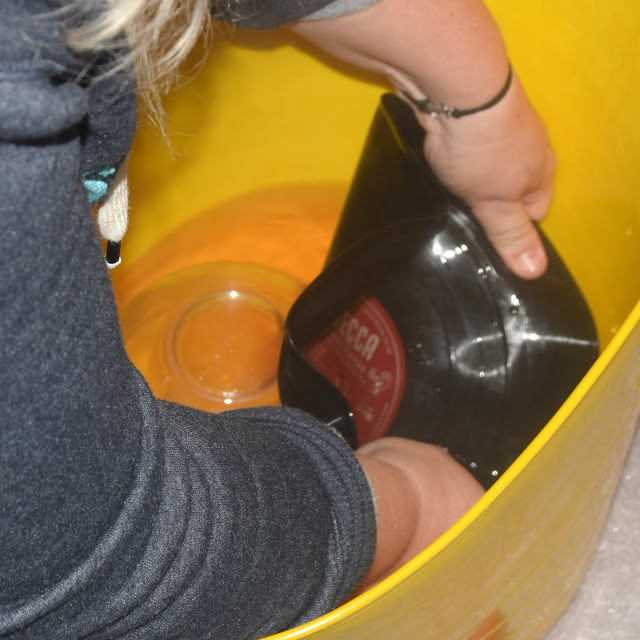 There is also a ‘keep warm’ function which meant if I needed a little more water (for up to 30 minutes after it boiled) I could grab it quickly without the need to reboil – perfect! I love the look of this kettle too, it just screams quality with it’s touch screen digital display and black stainless steel finish. The smooth action lid opening and stylish design mean it would look great in any kitchen too. The double wall makes it cooler too touch which is great when you’re clumsy like me! 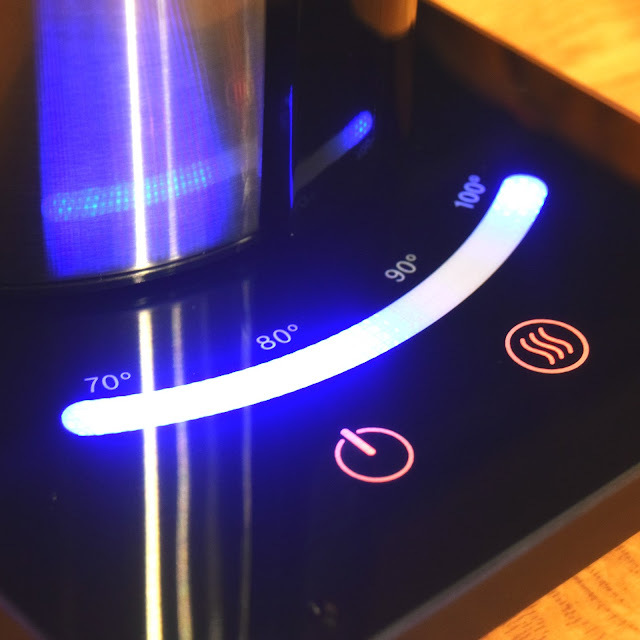 When using for normal every day tasks like teas and coffee, you can simply select a lower temperature instead of having to wait for your drink to cool down, how cool is that? Changing the temperature in 5 degree increments between 70 and 100 degrees. There’s also a filter included that can be cleaned easily when needed, as well as a nice chunky handle which is great for weaker hands like mine that struggle to grip narrower handles well. Currently on sale at Euronics for £99.99, this is a higher price kettle, but it’s so worth it with all the features and quality of the build. The display and touch screen are so easy to use, this is far from your average kettle and perfect for today’s craft! It’s amazing to think that despite all advances in technology, the best way to remove creases from clothes is still via the use of steam power. You press that button on a steam iron, there’s a whoosh and the creases go. 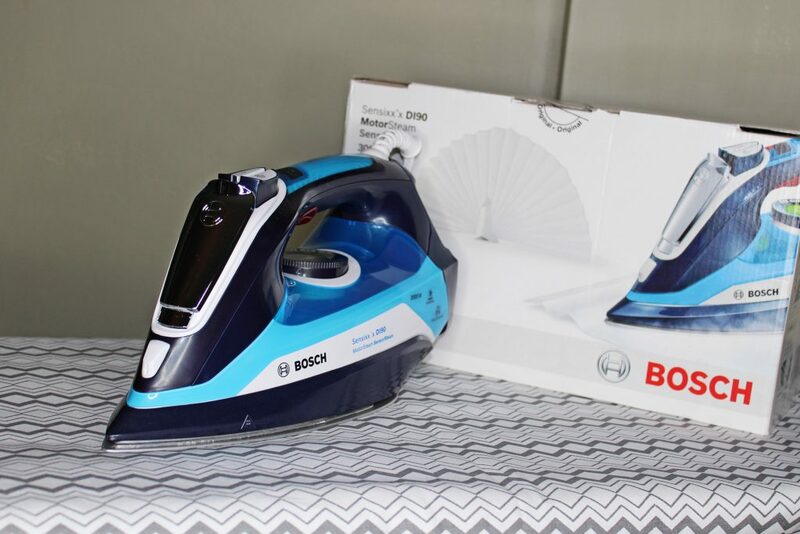 Introducing The Bosch Sensixx’x D190 Steam Iron. This, By The Way, Is How I Look After Three Hours Of Non-Stop Ironing. 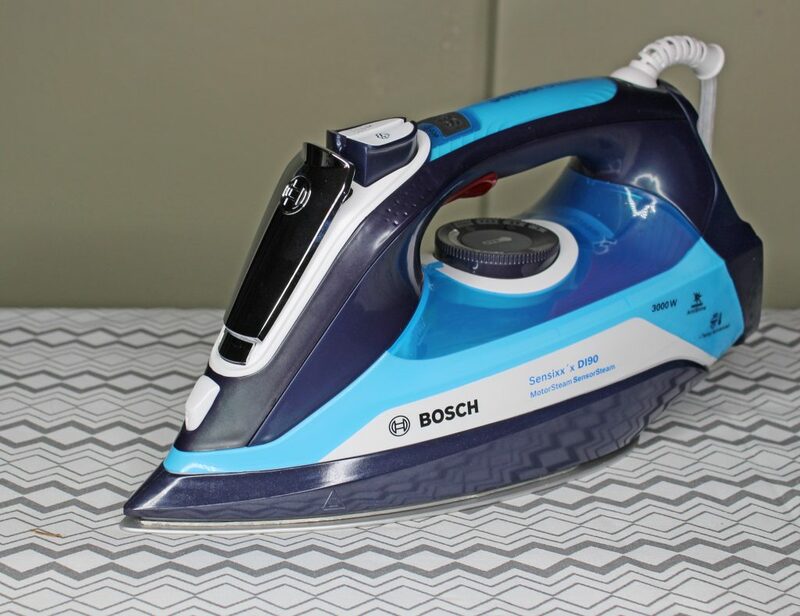 The oddly-named Sensixx’x D190 is one of the latest steam irons to be produced by Bosch. It’s available from euronics and I was asked if I’d care to put it through its paces. The timing was ideal as a year or so of use relying on London’s notoriously heavy water had left our previous steam iron caked up with limescale and on its last legs. Here’s how the Bosch Sensixx’x D190 coped with the Adams’ family’s laundry. Lifted out of the box, this product was noticeably heavier than rival products. It’s perfectly manageable, but you do get the impression there are some serious mechanics inside the iron. Straight Out Of The Box. 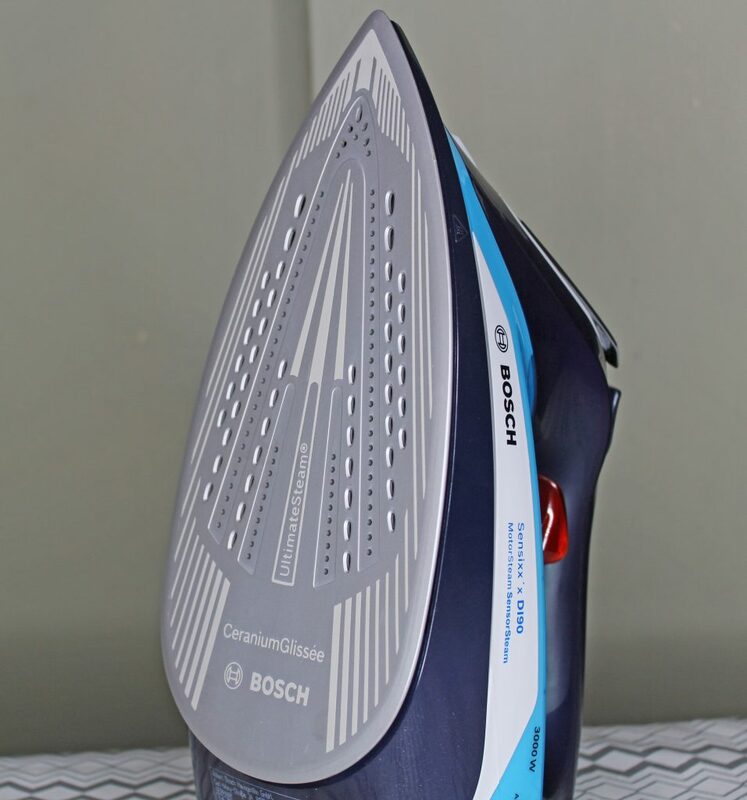 The Bosch Sensixx’x D190 Steam Iron Is Not Steam Age. Cut away images on the box certainly suggest there is a hefty motor in there producing steam. As this product requires 3000w to operate, it clearly is an impressive motor. The soleplate is quite sizeable. 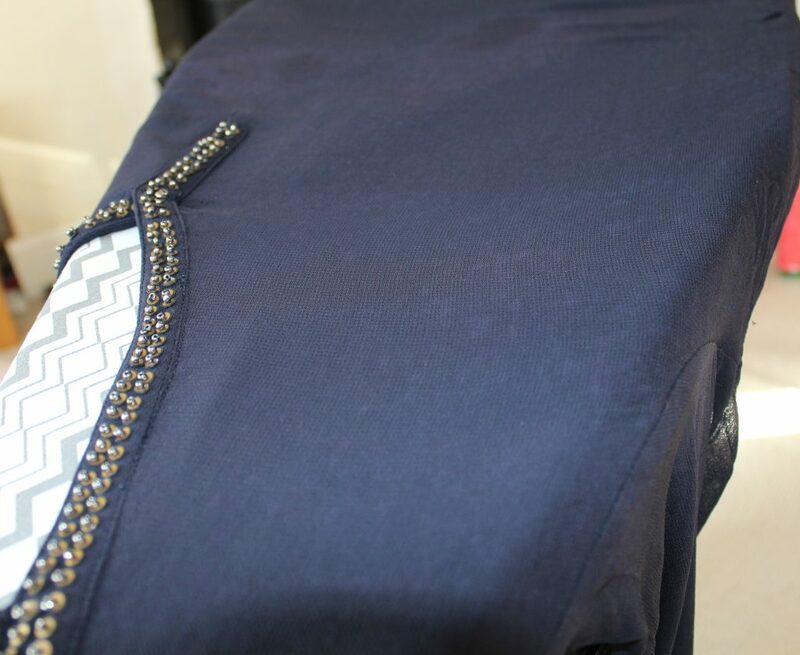 It’s very smooth and in use, glides easily across the clothes you are ironing. The controls are all very standard and don’t really need any explanation. There are, however, a couple of special features that I will come on to in just a moment. 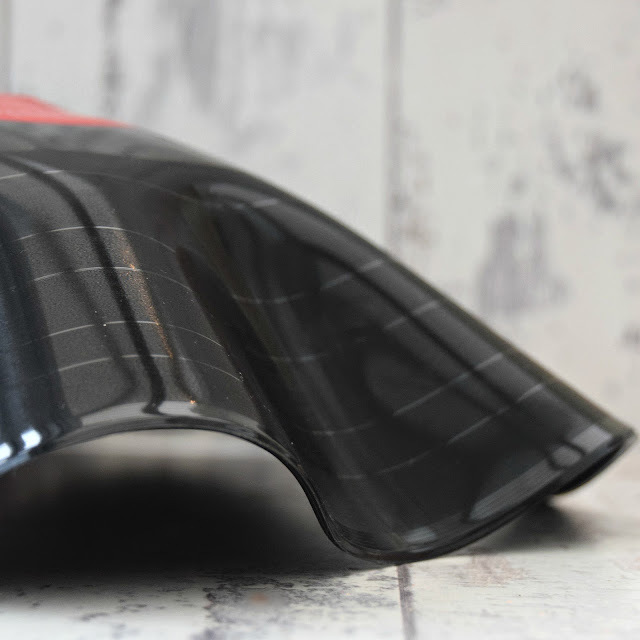 The iron is designed to work with tap water, although it does come with a bottle of anticalc additive that you can add to prevent limescale build-up. The water inlet is covered by a large inlet lid at the front of the iron. Filling it with water is very straightforward. 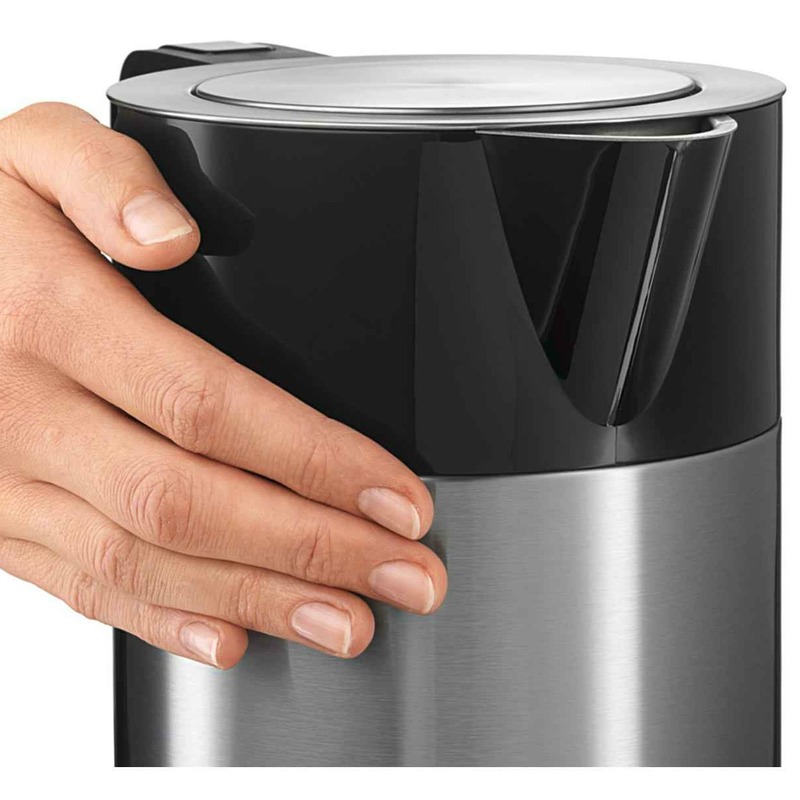 You control the steam using the spray and steam buttons on the handle and the temperature control. While steam may still reign supreme, don’t be fooled by the Bosch Sensixx’x D190. It boasts some of very advanced features. First of all, the handle has a sensor in it. 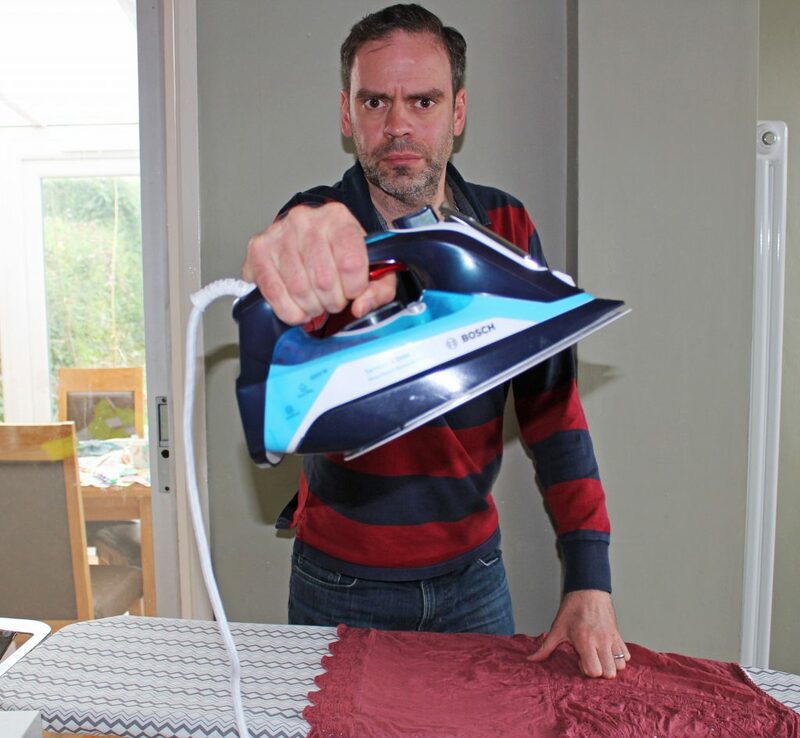 If the iron can’t sense your index finger gripping the handle, the steam function will cease working. In addition to this, the soleplate stops heating up. Note The Controls For The Steam Iron. It’s Very Easy To Use And Self-Explanatory. See Also The Red Section Of The Handle. If You Don’t Keep Your Finger On Here, The Soleplate Cools Down And The Steam Function Turns Itself Off. Let me, however, put this into context. I’ve experimented with this a couple of times. The soleplate will retain some heat, so the iron should not be left unattended. If, however, you have the temperature control turned up to maximum, it won’t stay at that temperature. It will hover somewhere beneath it. The i-Temp function is also worth mentioning. While you can adjust the temperature in the usual way to accommodate delicate fabrics, man-made fibres, linens etc. the i-Temp setting will do it for you. I was very tough on the iron while testing this feature. I didn’t expect it to work at all, but I couldn’t fault it. It went from man-made fibres to heard-wearing cottons with ease. It didn’t mark anything and produced great results. There is one further function. This is an anti-shine function. 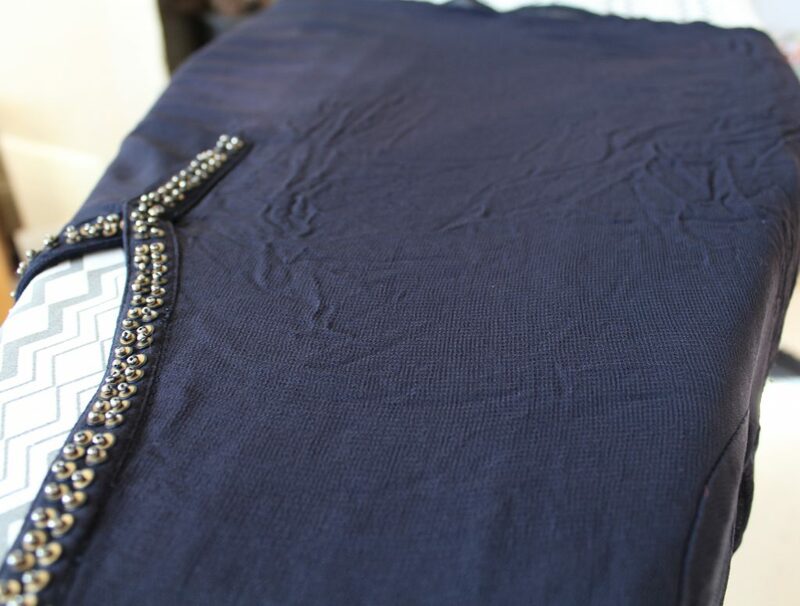 The aim of this is to stop darker fabrics going shiny when they are ironed. As with the i-Temp function, it seems to work very well. I will just add that the iron can be used vertically. This is to enable you to iron curtains, should you feel the need. I’ve been using the Sensixx’x D190 for around a fortnight. This includes a mammoth three-hour session when I had to deal with a ridiculously large pile of laundry. It’s performed very well and handled some incredibly, heavily-creased items. It’s done it all with ease and I’ve found all the functions to work very well. One Of Mrs Adams’ Heavily Creased Tops. It is slightly heavier and a touch larger than many rival products. It is also a little on the noisy side. Something, I assume the motor for steam production, makes a ticking sound when in use. It’s nowhere loud enough to put me off the product, but if you are in the habit of listening to the radio or watching TV while you iron, you may find yourself increasing the volume slightly. Mrs Adams’ Top Immediately After Being Ironed. Considering the amount of technology packed into the Bosch Sensixx’x D190, its price tag of £109.99 is very reasonable. It’s a heavy-duty item and I’ve been very impressed by its performance. As I said, it does create a little noise, but it’s not too loud. We’re delighted to have it a part of the family. We’re hoping to get plenty of use out of it. For further information or to buy, please do visit the euronics website. By Guest Blogger, Dad Blog UK. For almost 100 years, Colebourn’s has provided the Isle of Man community with top-quality electronics and even better customer service. Staying true to its roots, you can find this electrical store on the same corner where it originally opened – four generations later! Offering a unique, family-run experience, their dedication shows, with staff happy to go the extra mile for customers. Less than a quarter of the Shetlands are inhabited, but over 23,000 call them home – among them are the staff of George Robertson. This shop was founded by electrician Geordie Robertson in the 1940s, and since then has been passed on to two generations of staff. It remains independent, in the hands of those that have made it succeed, and continues to be a lifesaver for islanders. Sat proudly in the bustling Woodseats area of Sheffield, there’s no easier way to find appliances than at Williams Electrical Shops. With a sparkling reputation in Sheffield since 1905, this independent, family-run store comes out on top of national chains – and has awards to prove it. “We’re not just a family business, our business is a family.” (Marcus Holbrow, MD and great-grandson of founder). Alongside Wiltshire’s magnificent history, unique shops and family-run eateries, you’ll find Knees Home & Electrical – one of Euronics’ oldest stores. Since 1879, this independent family business has gone from strength to strength, but one thing has never changed – Knees remains at the heart of its community, and always puts customers first. Want to know more about AEG’s new 7000 series washing machine? 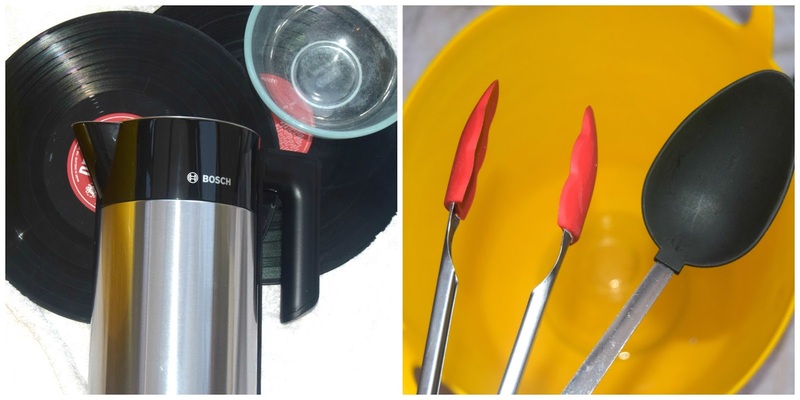 Interior stylist and blogger, Pippa Jameson, has carried out an exclusive review of its innovative features and functions! Pippa explored the extensive range of wash cycles and was particularly impressed by ProSteam technology. She also compliments its contemporary style, designed for usability. Find out more below. We are in the process of a home renovation and over the next 4 months we are knocking down walls (!) changing the decor and updating appliances, including a new washing machine. We have gone for an AEG 7000 ProSteam. It’s an 8kg model but way more advanced than our old one, it even has a steam option for clothes but I will come to that later. In terms of aesthetics, it’s a good-looking machine. The overall look has a soft fluidity to it and is absent of any hard lines, similar to our cupboard handles. I also like the fact that it has a black control panel as this ties in nicely our raven coloured cabinets. Even though the drum is the same size as our old machine, the style of the door is wider giving the appearance of a larger model. Another stylish touch is the matte silver door frame, it’s a simple addition but adds to the contemporary feel. I was a little overwhelmed by the digital display and all of the wash cycles that were on offer, including this curious steam programme. I think it’s great to have an advanced machine but it does need to be user-friendly, especially when you have a ton of grubby kids clothes to wash! It took some time to read the manual and I was amazed at how much there was to offer. Other than cleaning the clothes well, my main priorities for a machine are one that offers a quick wash for when you need something straight away, normally something child related, and one that is quiet. The digital display is fairly sensitive and takes a little getting used to but was really easy to navigate. As mentioned, the time save and quick washes are an integral part of my washing and so these are the programmes I tried first. However, before the wash starts, this machine weighs your clothes and adjust the settings accordingly ensuring you have the most economical wash possible – really. If that’s not good enough, the time save button has two cool settings; one press for time save on a normal load and then two presses for time save on a smaller load and reducing the length of the wash. Both of these cycles worked well. Being able to ‘pause and interrupt’ a wash is also a button that gets used frequently in this household as I am forever adding to a cycle that has already started. Good to see that this machine has one of those. Other good programmes are the sports, duvet and outdoors and anti-allergy, trust me when I say it does it all. The Crème de la crème for me has to be the ProSteam technology ‘steam’ button. If, like me, you avoid ironing like the plague, this little button will be your golden ticket but the question is, does it work and the answer is, yes. This button is not meant to remove all creases, just reduce them by 1/3 and so if you think all the creases will miraculously vanish and remove the need for ironing then think again. What it does do is remove enough creases to make the ironing 50% easier and that’s good enough for me. This machine has a big thumbs up for me. It is high-end at a cost of £599 but unlike other brands, it comes with a 5 year guarantee which makes it a sound purchase. Keen to see for yourself what this appliance has to offer? Take a closer look at the AEG 7000 series washing machine here. Or, if you’re after something else, then have a look at our other AEG appliances on offer. We’re all guilty of throwing away food, which affects the planet and our pockets. So, what’s the solution? It’s simple – make better use of your freezer! Not only will it reduce your waste, but it will also save you money. Curious to find out more? Our infographic is full of handy tips, including which foods you can freeze and how to make food last for longer. Click here to download the infographic. Viewing on Android? Good news – it’s already been downloaded. Go take a look now!